You might not know who Catherine Taber is, but you know the voice. For three seasons, she has played Padmé Amidala on the television series, Star Wars: The Clone Wars and also has the distinction of playing her character’s own mother, Princess Leia in the video game, Star Wars: The Force Unleashed. Among the other geek-centric roles on her resume are Cécile Cosima Caminades for the video game, Metal Gear Solid: Peace Walker, Rogue for X-Men Legends II: Rise of Apocalypse and as Penelo in Final Fantasy XII. The new season of Star Wars: The Clone Wars premiered on the Cartoon Network on September 12th and Cat took some time out of her busy schedule to chat with Forces of Geek. FOG! : You’ve voiced Padme for the Clone Wars film and the three seasons of the television series. Do you approach it as an impression of Natalie Portman or have you let it evolve into your own interpretation? Catherine Taber: It’s definitely not an impression. As an actress, I like to take on the role and make it my own, which is what keeps it true, and honest. I always liken it to doing Shakespeare. Many actresses have played Ophelia. But you don’t try to mimic what the previous actress did. My goal is to honor the character that is written. I certainly watched Natalie Portman, who I greatly admire, but I also watched Carrie Fisher, for instance, as inspiration. I studied the Star Wars database and incorporated experiences, events, and life lessons of the characters. 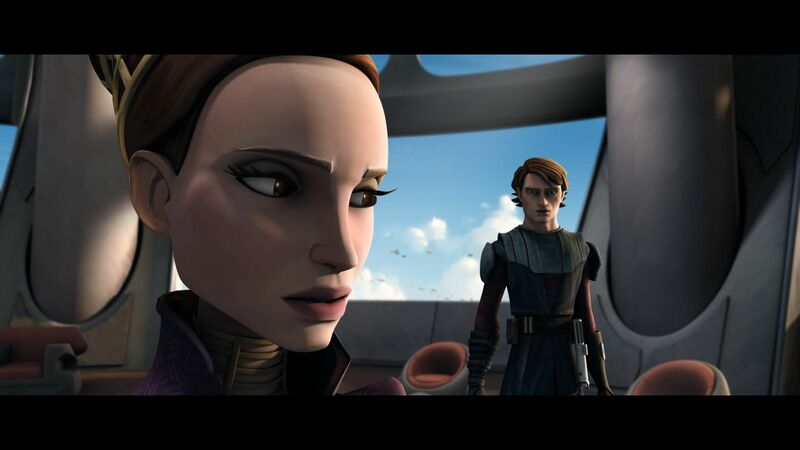 In The Clone Wars, our Padme is experiencing things and situations she did not face in the movies, so I need to create unique and original reactions based on her life. Luckily our amazing director Dave Filoni let me know right away that I didn’t need to try and sound like anyone else. He gave me the freedom to make Padme my own, and I am really grateful for that. You also voiced Leia in the video game The Force Unleashed. Did that require more of a sound alike execution and what was it like portraying such an iconic character? Carrie Fisher really is an ICON. I seriously love the footage of her original screen test for Leia. She is so awesome. I guess they had tried to find an actress to play the role for a while. Carrie couldn’t really do it, because this Leia in “The Force Unleashed” is supposed to be before the Rebel Alliance is formed obviously, so she needs to sound like a teen. Lucas Arts knew me as Mission Vao, from “Knights Of The Old Republic”, which was my first voice job, and I think they thought I actually sounded too young. Finally after not having success finding someone, they thankfully gave me a shot. We thought she would have that slight proper accent when talking to authority figures, but would be a bit less formal with Star Killer. Because even “early” Carrie Fisher has a lower vocal register than me, it wasn’t about trying to sound exactly like her tonally, but trying to sound like her in “character”, only several years younger. I am so glad to have had that chance and now I just need to play the granddaughter, Jaina, to complete my trilogy! Do you have a preference for camera work or voice work and is there a particular kind of character that you would like to play that you haven’t? They are sort of the same to me. I don’t really approach them differently. My focus is always in creating a character. I just get a different set of tools to use to accomplish this. I tend to play inherently good characters, which is actually great by me, but I imagine it must be fun to play the villains, like Darth Vadar or Cad Bane. I do, however, dream about playing a pirate at some point. Is that weird? Probably! On your website, you mention that you are a collector. What do you collect? I want so badly to say “explosives” or “shrunken heads”, but I have a few, perhaps less exciting, collections. There are my Star Wars T shirts. My fellow Clone Wars-er Ashley Eckstein recently started a clothing line that includes some awesome new Star Wars shirts that I just love! Alice in Wonderland memorabilia, come on. I also have a collection of Antique fishing lures that I recently started because I think they are really cool looking. I also collect things that pertain to characters I have played like this really beautiful drawing Dave Filoni did of me “fused” with animated Padme, and another drawing from Hideo Kojima that I got after completing Metal Gear: Peacewalker. Oh, and I may have a few Star Wars figures and toys too… Allegedly. Hmm, most of the stuff I like is actually not awful. I mean, I LOVE Deadliest Catch which is technically a reality show, but it’s really good. I admit, I do occasionally get sucked into one of the “Housewives of” episodes… They are just usually such train wrecks that I can’t believe it. That’s the kind of thing I would try to quickly change the channel if someone walked in the room and caught me watching for sure. You also created the Games for Soldiers program which accepts donations of video games and comic books to be sent to overseas to American Soldiers deployed in Afghanistan and Iraq. How and why did you start this initiative? I am an army brat first and foremost, so I grew up with a clear understanding of what our Nation’s Military means to our way of life. Two years ago I decided I really wanted to do something, on a personal level, to let the men and women deployed in Iraq and Afghanistan know that I was thinking of them, and that I was grateful for what they and their families were sacrificing on my behalf. I work in video games and I know that many of the troops really enjoy gaming in their downtime. It just seemed like a perfect fit. I try to get donations from companies and individuals. I have had kids send me all their games, and fellow actors give me consoles and games. My awesome parents are my biggest “shipping cost” sponsors. So many great people have contributed in so many ways, even just a note or letter to include a box means the world. I am always accepting donations of games, new or used, comic books, and dvds, so if any one out there is interested – they can email: [email protected] or email through my website www.catherinetaber.com. I try to do a big push around the holidays, so now is a GREAT time to donate… I’m just sayin’…. Geek is the new POWERHOUSE. I think the entertainment industry has finally come to the realization that the science fiction/fantasy crowd is a force to be reckoned with. They are the smartest, most creative and most loyal audience out there. When you give them something really great – you truly strike gold, in every sense of the word.